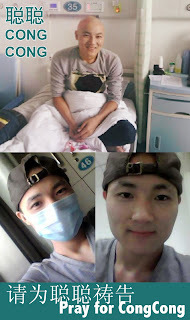 I wanted to let you know I received an email this weekend that CongCong is home now and healed of leukemia. He is now in the arms of his Father. Thank you for hearing of a need and standing in the gap. You heard about an aged out orphan who was facing leukemia alone, with no mom to give him hugs or dad to pray for him and you became his support team/makeshift family. It has been beautiful to see the love God has designed over the past year and a half to be an extension of His Fatherly arms until now when He can take CongCong and give him a big hug, Himself. People have gotten involved from Asia, Europe and all over the US lifting CongCong up in prayer. You have sent cards, family pictures, emails, and drawings. Some of you have even gone to visit him in Xi’an. Also, a big thank you goes to Aaron, a brother who lives in China. He arranged a support group of university students he works with to encourage CC through the hard treatments of the past year and a half. In addition to being there for him, they pulled out all the stops and put together the Make A Wish type project last summer. Their intent was to make it some of the best days of CC’s life. The adventure was a success and had all of us watching, amazed at the opportunities God provided to put a huge smile on CC's face. CongCong loved cooking and God even brought along a European chef at one of the nicest hotels in Xi'an who got involved and donated cooking lessons, in the hotel kitchen. Earlier in this week, before CongCong passed away, I received a photo of him and an email update of how he was doing. In the picture he was lying in a bed, at that point he was still conscious and had an expression that spoke of his pain; yet all around him were the pictures and letters so many of you sent. They were propped up in the area near his bed and on a small table next to his bed. This love meant a lot to CongCong. Thank you for seeing a need and being a family to CC. Thank you for praying for him and loving him. for a family doesn’t stop just because an orphan is a certain age and must leave the orphanage. Kids don't suddenly grow out of being an orphan or out of needing a family. The heartbreaking reality is that there are many CongCongs out there in the world. Youths who have aged out of the orphanage and suddenly face a world without the support of family and community. This situation is intensified when illness is involved. How does one face leukemia on their own? Or, pay for living expenses when they are too sick to work? That is what our CongCong was facing. So thank you again for your willingness to bring him before the Lord in prayer and uphold him with your expressions of love. Thank you so much for your prayers for CongCong. In the last update, he was waiting for clearance from the doctor to leave the hospital for a short time and enjoy the "Make A Wish" type activities that our friend Aaron planned. The Father answered our pr@yers! Exchanging a hospital bed for rest in a beautiful hotel, CongCong was able to enjoy cooking lessons with the hotel chef, swimming, a party with some friends and even homemade cookies. In planning, Aaron had the goal to make these days the best ones in CongCong's life. The smiles in the pictures say it all! So after this amazing adventure, CongCong is now back at the hospital in Xi'an stronger and more encouraged in the Father's abundant love. 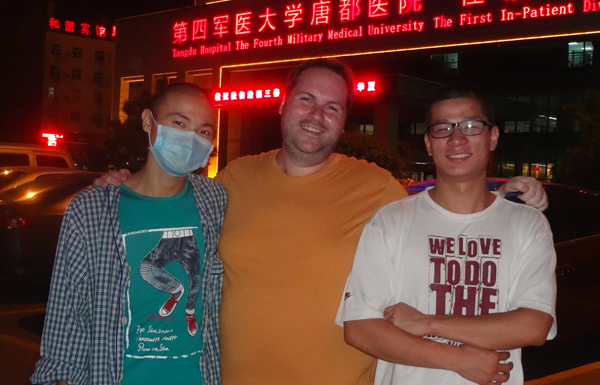 Aaron has returned to his home in Southern China and has shared an update of CongCong's needs. 2. Encouragement: He needs people to continue to send him letters of encouragement and visit him face to face if they live in the Xian area or travel through. 3. Bone Marrow Transplant: They are currently looking for a match and the expense is a lot...however the orphanage might take care of this...please pr@y. 4. Daily living expenses: Since CongCong is unable to work and the orphanage doesn't help him with this... this is a big need. A fellowship in China has given funds which will provide for the months of July, August, September...but after that there is nothing. I think it would be good if we can get some monthly sponsors to help with his expenses...1000 RMB a month (160 USD) which covers food, transportation, etc. In my mind, what would be cool is if a fellowship or an individual sponsors CongCong for a month, and during that month they could commit to pr@ying for him. I received the following email from our friend Aaron in China. He is currently visiting CongCong and Kobe in Xi'an. Wow. This is such amazing news of what God is doing on behalf of CongCong that I couldn't keep this all to myself...I want to share it with you! Thank you for your continued prayers for CongCong! About a year and a half ago, I learned about CongCong and his story and situation and my heart immediately went out to him. I was amazed at how much this life has gone through in being an orphan and now suffering with leukemia. He became a believing brother and needs pr@yers, love, support, and encouragement from his brothers and sisters all over the world. The university students gathered together to start and encouragement QQ group in which CongCong can talk to us anytime for encouragement, support, or just to talk...the students also have sent him many letter, cards, and a care package. I promised him that sometime this year I would visit him in Xian...so here I am :~). I arrived to Xian on Saturday, and am SO thankful that HE provided the finances and this opportunity to visit CongCong. The timing couldn't be any more perfect as Kobe just finished the school semester and is free, CongCong needs some encouragement more than ever as he going through another round of chemo and the next step is to receive a bone marrow transplant. On Saturday evening, Kobe and I went to visit him in the hospital and CongCong was nothing but smiles as we just sat there and talked...a friend from Qingdao that is also in the area visiting brought homemade cookies and he tried them and loved them. CongCong is a very ordinary guy who enjoys and is thankful for the simple things in life...it is very clear that he may only a couple friends that take the time to visit him...I hope that through being here, I can find some others who will go spend some time with him regularly. Sunday morning, Kobe and I went to have some time of pr@yers and study with him. I was able to share what HE laid on my heart about running the race in H@brews 12 and also about how we need to see HIM first M@tthew 6. As we shared, there was a father/daughter also in the room and they were listening to us attentively...come to find out they are believers too so we were all able to talk together and how cool that HE arranged a believing family to be in the same room as CongCong...I think now that both know each other are believers that they can talk and encourage each other more as both are going through so much...Kobe said this is a miracle. Sunday night, we returned to the hospital to take CongCong out for supper and spend the evening together. Sunday, CongCong received a lot of medication through an IV, a blood transfusion as we were studying, and in the evening before supper a platelet transfusion. My heart was burdened to do something REAL special for CongCong while I am Xian...knowing that CongCong is weak, I wanted to do something simple, but out of the ordinary and so I booked a standard room at a hotel located in the tallest building in Xian because I thought that it would be a place of comfort and rest, something special, and also if he wants to rest...he can...eat...swim, etc. Well, HE has his ways of arranging things even better than our plans...I sent an e-mail to the hotel and they are on board to make this "treat" as special as they can. I have tears in my eyes as I write this because I just know that HE loves this special brother, CongCong, and wants to wrap his arms around him in encouragement...and use us and others in Xian to do it. The hotel has upgraded our room to an executive suite on the 2nd from the top floor with access to a private lounge where we can get unlimited food anytime we want. They also want to throw a party for CongCong on Tuesday evening and said that I could invite whoever I want and if I know any of CongCong's friends...they can come. Because I told them that CongCong has an interest in food and cooking, the French chef is going to do a private cooking class on Wednesday so he can learn to cook an Italian and French dish and the chef is also making a special cake for the party. I've received e-mails and phone calls from the GM, who is from Germany, his assistant, and the French chef...all saying they want to help as much as they can and that we can count on them making these days the best days of CongCong's life...unbelievable...thank you, J@sus! Finances are limited, but HE provided this special treat more than anything that I could do or arrange...wow! CongCong is now in the hospital...and we just talked to the doctor on the phone about him being able to leave for a couple days. CongCong has to have strength and a certain level of something concerning his blood so that he can leave...I know that HE has arranged these special things and just want CongCong to enjoy them as much as he can...I know that powers all around the world can make a difference...so please, please, please PR@Y...that tomorrow, we can pick him up and that this "treat" will give CongCong and extra boost and that he will feel HIS love more than ever! Thank you in advance for pr@ying and I'll keep you posted on how things go. I wanted to send this e-mail as I have a busy day ahead...going now to pick out a new outfit for us to give CongCong (with money given from a USA brother), meet some friends from college, tour a little bit, visit CongCong, and prepare for the activities tomorrow. HE is SOOO good!!! Please pr@y!!! Thank you, thank you, thank you!!! We received an update and a request in regard to CongCong from our friend, Aaron Burns, who is over in China. We are really sad to hear that CongCong is not doing well right now. Aaron talked to Kobe on Tuesday morning and CongCong was coughing up blood and now is at the hospital doing some treatments. The doctors have told CongCong that he needs a bone marrow transplant. I have included some of Aaron's letter so you know how to pray. Please keep CongCong in your prayers and if you feel led to help in any way, Aaron's contact info is below. "...In keeping in touch with Kobe and CongCong, I promised CongCong that I would try to visit him sometime this year. It's difficult to get away from Dongguan with Treasures of Hope and SIGMA, but HE has given me peace and made some time for me to go to Xian to be with CongCong and Kobe from June 29-July 4. I'm excited about the trip, but also kind of nervous too as it doesn't look like CongCong is doing very well...I just want you to please lift me up as I prepare for the trip that HE would use me and Kobe to encourage the precious life who has struggled so much. I know that each of you have played a HUGE part in helping and encouraging CongCong and I hope we can all lift him up together. When I told CongCong that I was coming, his response was, "I hope that I'm still here to see you." This breaks my heart...things don't seem to be looking good. I talked to Kobe, who is really struggling about this, and challenged him that we ultimately have to trust our Father with each situation in life and that HE has a perfect plan and time for all of us here on this earth. I'm SO thankful that both Kobe and CongCong are believers and trust that as we gather together these days that we can lift and encourage each other for HIS honor and glory." Aaron is going to do a "Make A Wish" type event for CongCong. Knowing that CongCong is weak and tired, he is hoping to have some activities that might provide CongCong rest and comfort for a few days. Aaron is investigating an opportunity for CongCong, Kobe and him to stay in a nice hotel during Aaron's trip to Xi'an - as well planning some activities that would be fun treat for CongCong too. Aaron has been in touch with the GM of the hotel and told him that CongCong has a love for food and cooking and is hoping that the chef there will do kind of a mini-cooking class with CongCong. Aaron writes, "..still thinking of some other special things that we can do that aren't too tiring or upbeat, but I know that HE will put the trip and the perfect contacts together for this special guy! The GM is a foreigner and they are willing to help and do some "extras" for CC." If somebody is interested in helping out, they can e-mail Aaron at aaronjay0824@gmail.com (please avoid use of sensitive words in your email) and financial donations can be sent to the address below. The money will be used to encourage CongCong while Aaron is there and also to help with some medical expenses. I am all right and so is congcong. He is good. He just finished his 4th treatment and he is doing ok. We were talking about climbing the mountains 2 weeks ago, so maybe we will do that later... These were taken when he was having the 4th treatment. My gf and a friend from BMH named Emma went to see him too, Emma (on the right of the picture) brought him the flowers( the hospital didn't allow people to bring flowers inside the patient room but I said " it is for the doctor( pretend that I was visiting a doctor)", so they let us in haha. Actually it was for the doctor or the nurse, because once they found the flower, they would take it away. CongCong is alright now, don't worry... I am really grateful! Letters of love and hope needed! Do you love opening up a cheerful "get well" card when you are sick? CongCong's battle against leukemia continues. It has been several months since we first heard of this orphan's fight for his life. Wouldn't it be great if we could send a package to China filled with cards for him to open and arrange near his hospital bed? Since his cancer treatments continue, let's continue to deliver God's love and hope to CongCong. 1. Make or buy a card. CongCong loves pictures. You can include a picture of your family or if your kids want to draw CongCong a picture that would be great too! 2. Send it to the Bring Me Hope office before Monday July 16. We will collect your cards and mail it to China! After 5 days of a high fever last week, CongCong was excited to have Kobe visit the hospital on Sunday. The two friends were able to talk and open up some mail sent from the States. Kobe said that his friend was weak, but in really good spirits and excited to recieve a picture. He loved the bright paint colors and his favorite part was a flying bird which he thought was pretty fun. Some other news that has brightened up CongCong's life recently is that God has answered a prayer in BIG way. 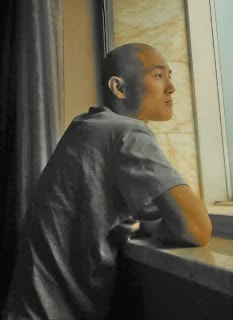 In a way only God can accomplish, CongCong was connected with a fellow "brother" who lives in China working with university students. This friend and the students he works with, have taken on the job of being CongCong's IN China encouragement team with gusto! They started a QQ group (Chinese instant messaging) to chat with him since his hospital days have often been a mix of lonliness and boredom. They are praying for CongCong and they have even given him several amazing gifts that will encourage CongCong in his faith and make hospital life more comfortable, like an mp3 player with Chinese worship music. God is good!